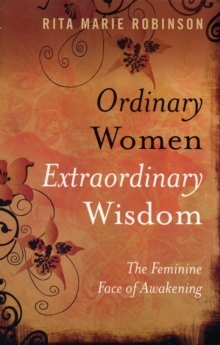 "The Extraordinary Wisdom of Ordinary Women" is a collection of intimate, heartfelt conversations with women spiritual teachers who live and look like ordinary people. They have kids, husbands, jobs, and bills to pay. What makes them extraordinary is that each woman has awakened to her true nature. And while that sounds like enlightenment, it doesn't look like the old stereotype of transcendence, detachment, and bliss. Quite the contrary. This is the feminine half of the spiritual journey - bringing it down to earth and embracing all of what it means to be human. These real life stories show by practical example what it means to be fully awake and fully engaged, to meet the world without resistance - even and especially when it's not easy - whether it's death, divorce or illness. The invitation is explicit..."if these ordinary women can be fully awake and fully human, why not me, why not you? And why not now."